An ingredient or agent that can be added to other food ingredients in order to change the viscosity to create a stiffer or a more dense food mixture. Also referred to as a "liaison," some thickeners assist to disperse solids within a mixture, thus increasing the viscosity and making the substance less fluid. Other thickeners assist by forming an emulsion to suspend one liquid within another, such as egg yolks or gums. Heat can also be used as a thickening agent, warming ingredients to a point that stiffens the food or by boiling off excess liquid to remove or reduce the volume of liquid contained in the food, thus thickening it. Agar - A form of seaweed that has been dried to be used as a thickener in food. Traditionally used in Asia, it can be substituted for gelatin. It actually sets stronger than gelatin and does not require refrigeration to set up, so not as much of it is needed to achieve the required effect. It is often used in commercially produced ice cream as a thickener. It is also known as agar-agar, kanten and Japanese gelatin. Arrowroot - a starch thickener, very similar to cornstarch, which is most often used for sauces and gravies. One of the key attributes of this thickener is its ability to withstand extended periods of heating without breaking down. Beurre Manié - Similar to a Roux, this paste is made with equal quantities of flour and butter kneaded together to be used as a thickener that is whisked into sauces, soups, and stews. Unlike Roux, it is not cooked until it is added to the sauce. Blood - a traditional thickener used more during earlier years of food preparation than during the current era. Blood is not easily available or desired by consumers, so it is not often used. Since some states and regions make it illegal to use the substance, it is restricted for use in many areas. Butter - a common thickener for a variety of sauces, often being added as a finishing agent for the sauce. It may be added to sauces as an emulsion, becoming a flavor enhancer and thickening agent for hot liquids, such as monter au beurre sauce, or it can be simply added to smooth and soften the texture and flavor of a sauce. Carrageenan - A group of related carbohydrates produced naturally by boiling red seaweed, carrageenan is used as a thickening agent for a variety of commercially produced food items such as milk, ice cream, puddings, syrups, marshmallow fluff, and other food items. Cheese - a type of thickener that is not often used due to inconsistent results. Fresh cheese is required to make the best sauces and as the cheese ages from fresh to several days old, it becomes rougher in texture and possibly more acidic in flavor. Cornstarch - A flour-like substance obtained from the white heart of the corn kernel. It is tasteless, but is very useful as a thickener, having double the thickening properties of regular flour. It is widely used to thicken sauces, gravies and puddings. It is best to stir it into water first before it is added to other foods, so that it can be more easily incorporated without creating lumps. However, if it is cooked for long periods of time, it will decrease its thickening qualities. Cream - a common thickener for pan sauces, wine sauces and other white sauces. It provides a rich flavor and smooth texture to reduced-cream and double-cream sauces. Crema - It may be used as a food garnish for burritos, enchiladas and fajitas, as a thickener for meat sauces, or to give savory dishes a thicker consistency and richer flavor. Egg Whites - Beaten egg whites are often added into many baked items and desserts, providing volume, thickening the ingredients and acting as a leavening agent. Egg Yolks - The yolks of eggs work well as a thickener when making different types of sauces, adding both a rich flavor and a smooth consistency. Beating 3 yolks with 1/2 tablespoon or so of cream will assist to thicken a cup of liquid. Typically, a warmed sauce that is to be thickened is used to temper the eggs, whisking a small amount of the sauce into the egg and cream mixture before adding the entire yolk/cream mixture to the sauce as it is being heated. Use caution when heating the sauce with the yolks, since yolks warmed excessively can coagulate and adversely affect the stiffening process, hardening the consistency more than desired for the sauce. As the sauce is heated, do not exceed temperatures above 185°F to 195°F. Flour - All-purpose flour is a common thickener mixed into liquids, such as meat drippings for gravies or water and other ingredients for batters. 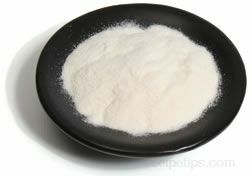 Potato flour (potato starch), which is gluten free, is fine textured flour made from cooked, dried and ground potatoes. When mixed with other flours in bread making, it produces a moist crumbed bread. Flour is also mixed with butter to make another type of thickener referred to as a roux. Gelatin - The gelatinous juices released from meats or fish during the cooking process. As a natural gelatin, this highly flavored juice is added when the sauce is finishing its cooking phase in order to provide a glace such as "glace de viande" for meats or "glace de poisson" for fish. The gelatin creates a syrupy-textured sauce that is often enhanced and thickened further with the use of a fat, such as butter. Groats - The whole kernels of grain, such as barley, buckwheat or oats that have been hulled, cleaned and sometimes roasted, but not cut or flattened. They are similar to barley and can be used in soups as a thickener to stiffen the texture of the soup broth. Mayonnaise - A dressing made with egg yolks, olive or vegetable oil, mustard, and lemon juice or vinegar. A rich, creamy dressing used as a dressing for salads, a condiment and as a thickener for other dressings. Pectin - A gelling substance found naturally in vegetables and fruit. Pectin is needed as an ingredient when making jams and jellies to thicken the mixture in order to make it gel. Available as a liquid or a powdered form in food stores, different brands of pectin contain different ingredients so it is wise to check recipes for instructions on the specific brand suggested so the ingredients required are used to achieve the desired results. The difference typically involves the amount of acid and sugar required to stiffen the food being prepared. Roux - A thickening agent made from cooked flour and fat (generally butter, but lard and vegetable oil are also used). It is often used as a thickener for sauces, gravies, or soups and is cooked to varying degrees to create a white, blond, or brown roux, depending on how it will be used. The accepted standard for the quantities of flour and fat to use for a roux is a ratio of 6 parts flour to 4 parts fat by weight. The quantity of liquid that will be added to the roux must also be considered when preparing the roux as well as the desired thickness of the resulting sauce, gravy, or soup. Sago - A starch that is extracted from the sago palm, used in baking, and as a thickener for soups and puddings. Seaweed - Often used as a thickener in soups, stews and vegetable dishes. Vegetable Purees - selected types of vegetables that can be pureed into a thick mixture for use as either a thickener or emulsifier. The puree can also add flavor to the food being prepared. Wheat Starch - Used for thickening sauces, gravies, and puddings. It is best to stir it into water first before it is added to other foods, so that it can be more easily incorporated without creating lumps.